One of my pet subjects is anything and everything to do with thyroid health – having suffered from an underactive thyroid myself – I know how incredibly debilitating it can be to live with a thyroid that isn’t functioning well, and I have enormous empathy for anyone who has a problem in this area. Some of the common symptoms of an underactive thyroid are weight gain that is difficult to lose, fatigue, depression, intolerance to temperatures – hot or cold – puffy face and eyelids, dry skin and hair loss. Too often these symptoms are put down to “stress” or the person being “lazy” – of needing to “eat less and exercise more” – but nothing could be further from the truth. In my experience thyroid conditions are not dealt with well by the medical establishment. The Gold Standard for diagnosing thyroid conditions is the TSH test – a blood test which measures Thyroid Stimulating Hormone. It is a measure of the signal that the master glands – the hypothalamus via the pituitary – are sending to the thyroid to encourage it to make more thyroid hormone. A higher result means that the signal is getting stronger due to inadequate levels of thyroid hormone, and TSH is being produced in higher amounts to “stimulate” the thyroid to increase production. A high TSH result is considered to equal an underactive thyroid. In Australia the range is commonly 0.5 – 4.0 (or 5.0) and anything within that range is considered normal. Hypothyroidism is only diagnosed or investigated further, when the TSH is above that range. 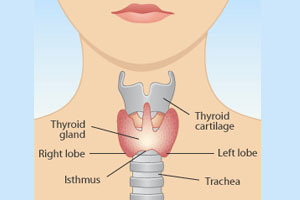 However there are other conditions that can lead to a poorly functioning thyroid gland that are not measured by this test, and unfortunately if the TSH test is “normal” you can have every thyroid symptom under the sun and your doctor is very unlikely to do further testing for thyroid antibodies or something called Reverse T3. Because of this many, many people are getting a misdiagnosis – they are being given antidepressant medication, told to eat less and exercise more to lose weight, and told that they are tired due to their “stressful” lives. In this second result it is very similar situation to the above patient, whereby the TSH is within the normal range, yet the antibodies are absolutely through the roof! In this case, the patient had to argue with the doctor to get the tests ordered, the doctor thought they were unnecessary becasue the TSH is normal, but what I have learnt is that the TSH is not necessarily an accurate reflection of thyroid status. 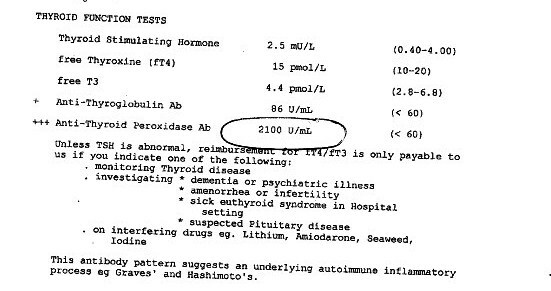 Thank goodness we pushed for this test, because as you can see, this patient has an out of control autoimmune condition that is destroying her thyroid function. When this result came back, the patient’s doctor said that there was nothing that can be done, all she could do is wait until the TSH went up enough to warrant replacement hormone of Thyroxine. Am I allowed to say WTF??? What the doctor is saying is: “We have no clue how to treat this autoimmune condition, and we will just wait until your thyroid gland is completely destroyed and not working at all, and then we know what to do because we have a drug for that.” Negligent, negligent, NEGLIGENT! In natural medicine, fortunately we do know how to treat autoimmune conditions, we do know how to lower antibodies, how to modulate the immune system, how to support the thyroid gland to function again – we have many tools at our disposal to assist in the healing of these conditions. The big lesson out of this for me, is how important it is to do further testing if you have hypothyroid symptoms, even if the TSH is normal. I have seen too many results like this, to believe that the TSH test is definitive for measuring thyroid function. I have so much to say about this subject, that I am currently writing a book about it! Stay tuned because it will be out next year! Leisa, thanks for this post. In the last two years I have had two return TSH reading of 216 (yes, not 2.16 but 216) and latest was 186 and everything in between. For so many years people thought I was lazy and depressed and there is not a great deal of good information out there on how to treat this through lifestyle and food. Being a Yoga teacher I have alway been reluctant to take Thyroxine but it recently got to a point where without it I could not fuction. Your post was really clear – just what I needed! I look forward to reading your book. If only this were the only thing that doctors get wrong Leisa! Have you watched ‘We Are Silence’ narrated by Judy Densch? My trust in the traditional medical profession disappeared many years ago. I will be very interested to read your book so I look forward to it’s release. My sister was diagnosed with Graves Disease many years ago and due to the lack of information and support available through doctors, she ended up setting up a support group on the central coast which included information for people suffering any all kinds of thyroid conditions. I think many GP’s in particular do not have a depth of knowledge in this area, or even in basic areas like nutrition. Oh, yes. I have Hashimoto’s, but a normal TSH, so no treatment. I will be interested in any possible way to handle the problem. I have had the condition for over 50 years, with ups and downs of thyroid levels. I have been very frustrated working with western medicine in an effort to control my thyroid. I just switched doctors so that I could get Armour instead of Synthroid. I am still having symptoms. I believe my problems are a result of lower immunity caused by my Muscular Dystrophy, but again..western medicine wants to only treat the symptoms as stand alone illnesses. Hi, I have had hypothyroidism for many years, and a few years ago I was diagnosed with Hashimoto’s and I am so glad that I didnt take the advice of the doctor and take Thyroxine. I went to see a Naturopath and she has helped. I recently got a copy of the book by Elaine Hollingsworth, “Take Control of Your Health and escape the sickness industry” and couldnt put it down. If you can get a copy, you will be totally surprised!. A quote from the book ” Has the following happened to you? You are feeling awful, with one or more symptoms, eg. exhaustion, cold extremeties, inability to lose weight, headaches, migraines, diabetes, and you go to your doctor for help. You complain of your symptoms and leave, clutching a prescription to take to the laboratory so they can test you for everything under the sun. And why not? Medicare or private insurance pays for it. When you return to the doctor, hoping to learn some painless, simple way to feel well again, you are told that all of your results are ‘normal’. If you remonstrate, the doctor may suggest a psychiatrist, which, if yu have any gumption, should get your back up”. Looks like I am the only male here so far. I came upon your website doing some research on a paper I am doing for my Medical Lab Tech program and wanted to share my similar story. I was Dx with Graves last fall. For 2 years I was having many of the classic symptoms of graves. My primary doctor at the time ran every basic test in the book but was unable to put enough of the dots together to figure out what was actually going on. Then in August of 2011 my right eye started to show bulging and tearing excessively. I finally went in to see my eye doctor and she ran the TSH, T4, and T3. Everything came back normal again…. She knew something was not right here and I have to say, was smart enough to ask when she didn’t know, for help and not just give up. She contacted an endocrinologist with me sitting right next to her in the exam room and made an appointment for me the very next day. The endocrinologist reran the the normal tests and the antibody test for graves and it came back very high. If it was not for my eye doctor refusing to give up, I would still be wondering what was going on with my body. I wish more doctors showed more of this kind of care to more patients. I look forward to reading this book when you publish it. Please send me an email when you’re finished so I can order it! Thank you so much for sharing your story with us, I really appreciate it. Yes, you are correct that many of my clients are ladies, as we do find a larger proportion of women do suffer with thyroid and autoimmune disorders, but that’s not to say that men don’t suffer from these conditions as well. I totally agree that we do need to see more doctors showing that level of care and admitting when they don’t know the answers and look further for information – thank goodness you had the antibody tests and found some answers – many don’t and it can be incredibly frustrating searching and not finding where things are going wrong. I wish you the best of luck on your healing journey, and absolutely we’ll keep in touch and let you know when the book is out later this year. just checking in for the book. Today is a down day. I am so tired of this battle. I really just want to hire 3 people 1) lawyer to sue the pants off every dr that refuses to take me seriously by pushing anti-depressants or NOTHING if I wont take them. 2) assistant to shadow me cause my memory is getting bad and the more these quacks dismiss my health – the angrier and more depressed i’m getting. 3) a nanny to finish raising my kids cause some days – i’m not a very attentive mom and i really want to limit their lifetime effects of my crappy health. Why hasnt’ any Dr even checked my adrenals or anything else to see WHY i can’t convert to T3, or why I still show low Vit D, D3 no matter how many gel caps I swallow. Why hasn’t any Dr ever checked on the protein and blood that keeps coming up in my urine these last 2 years. Not a good day at all. I’m sorry to hear that you having such a hard time with your health – you are right, it is so frustrating to feel so despairing and not be able to find answers from the medical practitioners we see. I can’t tell you how many times we encounter patients who have a similar story. I hope what I have written gives you the impetus to find a practitioner who knows about these issues and can organise the right type of testing for you. If you are having trouble, please don’t hesitate to contact us, as we may be able to do a long-distance consultation, or refer you to someone in your area that may be able to help. I need to come off the thyroxine for 2 months. help. I am now in the Gold Coast. Love and gratitude. involved unless it is one thing to do with Woman gaga! Those readings above are very similar to mine 5 years ago. 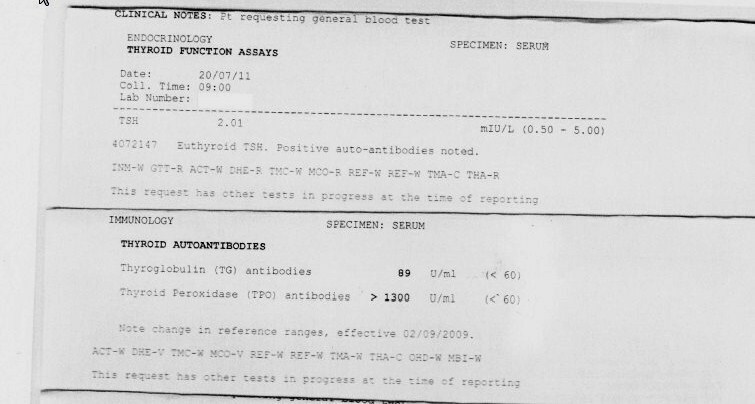 TSH, T4 & T3 were consistently normal but TG antibodies were a bit up and anti TPO was off the planet. I kept being told “I don’t know what is causing your symptoms but it couldn’t possibly be your thyroid”. A couple of years ago I started taking Kelp (iodine) tablets – 1 per day most days. After a few months my anti TG were normal and the anti TPO had reduced greatly. Tested again last week, both are now normal. This despite having been told by the endocrinologist that all I could look forward to was a long slow decline of my thyroid function until it collapsed. I had to fight to have a thyroid ultrasound and they found a nodular lesion in left lobe according to the GP that is considered normal??? Having done more research I will be changing GP and asking for further tests! I don't understand any of that result.. Do I have Hypothyroid or Hyperthyroid? Why my doctor didn't give me any medication. Do you think I need medication? If you have both been diagnosed with Hashimoto’s thyroiditis, there is a lot that you can do. Both of you need to see a naturopath quick-smart and get on a healing program. Medical practitioners do not know how to treat thyroid issues well – and in autoimmune diseases like Hashimoto’s they will wait until your thyroid is destroyed before they then give you thyroxine mediation for life. This is no answer and you will likely be unwell forever. Please book in to see Rhianna http://www.embracinghealth.com.au/naturopath and let us help you to both get well. I will say WTF!. I don’t mind!. This is me, total mess with an undiagnosed thyroid disorder. 18 years of GP appnts, endo, ultrasounds, strong family history and every symptom under the sun that scream a hypothyroid condition. I was given anti depressants that DONT work by a physchiatrist. He actually cant get my depression and anxiety under control. I did something totally out of character. I went to a natripath who actually listened and believed me, did all blood tests, not just TSH, iodine deficient, iron deficient (even after 3 years of strong Iron tablets from chemist) Vit d deficient and low cortisol. the first day of Spring, I have to go the USA to get treatment through a prominent gp/natripath (trained in both disaplins). Im having my phone consult tomorrow. He will write a script and it will be sent from the USA. No gp will write me a script in Australia because my TSH test is “within normal range”. Personally I would have flown to NY if needed be to see the guy because I cant live like this anymore. Good luck with your book. Can anyone help with a way to reduce these. Am trying gluten free at present but this in not easy as it's in so many foods. Thankyou. SO doe this mean that basiclly i have been an undiagnosed hashimoto’s disease for so long that the destruction of my thyroid gland has reached the point of abnormal function. I have had a diagnosis of hypothyroid disease on and off in my life and as soon as my TSH is testing in the normal range i am removed from levothyroxine or at times when my TSH tested normal i just wasn’t prescribed anything and told i was fine. I have NO ENERGY. Sadly, i use 5 hour energy’s, monsters and coffee throughout my day just to get by. I feel like people look at me like i’m lazy. I was always around 125lbs until december of 2014. I gained 35lbs in one month!!! Still with a normal TSH i was turned away and told to exercise, go to bed earlier and remove my tv from my bedroom as IT could be my issue. WOW!! Please help!! I still have only been diagnosed with hypothyroid, not Hashimotos. I had a doctor appt yesterday and literally told my doctor i thought i had hashimotos and asked to be tested for it. just waiting on my follow up in august. I have recently received a test result where my anti thyroglobulin is 102 kIU which is above 60 but my anti thyroid peroxidase is in normal range. TSH is in normal range. I suffer all the symptoms of hashimotos. Can elivated anti thyroglobulin alone by an indicator or hasimotos disease or any other diagnosis? Do you have any comments on Wilsons Syndrome? I have had so many of the symptoms and doctors just shrug their shoulders. I do not fit into the “norm”. I need to find an endocrinologist in Sydney that deals with this syndrome. Hi, I also have high antibodies of 308, also my CRP test is 12 when it should be 0 (in New Zealand) I also suffer with major swelling of my ankles which I didn’t realise was a thyroid problem!! I am having major problems reducing my weight . I havent had “Joy” in my life for a long time. I am taking 45mg Whole Thyroid in the morning on wake up and 25 mcg Synthroid at night.